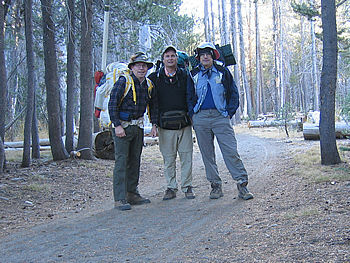 There were three of us on this particular three-night adventure: Gary Trott, Kelly Bandlow and myself, Tony Plutynski. 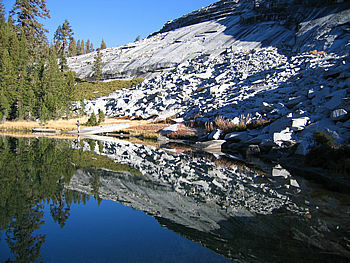 These are my favorite lakes in the Sierra for a short hike. I have been going here for over thirty-five years, and I have never been disappointed. However, it is a bit of a hike initially – a little over twelve miles to the first lake and another 1.4 miles to the second. Nevertheless, how many places can you say that you have fished for over thirty-five years and always caught your limit. 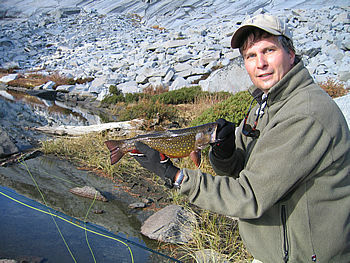 And in how many places can you catch twenty-inch brook trout? I have only seen others at these lakes twice over those thirty-five years. Because of this fantastic fishing and low usage, I will only reveal the names to those that are willing to make the trip, and to pledge to keep the same secret with the same conditions. We left about noon on the first Thursday before the first weekend in Oct. We got to Yosemite Valley about 4:30 PM, and since neither of my companions had been to the Ahwanee Hotel for the free afternoon tea, we decided to visit the hotel. Well, times have changed. The tea used to be free, but now they had prominent signs that you had to be staying there to have tea and crumpets. Undaunted, we did listen to the piano player and enjoyed the fires in the immense fireplaces of the large sitting room. It is worth a visit just to see a grand old hotel. My wife and I ate in the Ahwanee Dining Room for our wedding dinner. If you go, be sure also to see at the dining room. Kelly treated us to drinks out in the patio overlooking the Yosemite cliffs for a very pleasant evening. Next we ate at the cafeteria at the Yosemite Lodge and then we visited the Merced River to see the evening rise in the Valley. We drove to the trailhead so that we would sleep high enough to reduce the chance of altitude sickness. Arising at dawn, we fired up the stove and had some breakfast with warm cocoa that took the edge off the frosty morning. We were on the trail by about 7:30 AM, and before long we were peeling off the clothing layers to balance out the heat generated by the climb. The trail mainly travels through pine forest, and the shade helps keep the temperature reasonable. 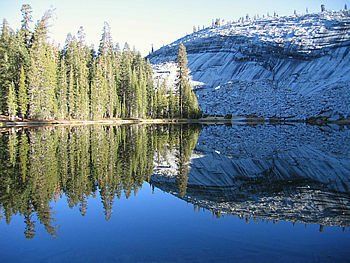 Although the climb is only about eighteen hundred feet, it still is a twelve-mile hike. There is ample water on the trail even in the fall in normal years. The trail is straightforward until the last mile and a quarter, which is only marked by a series of ducks. It is easy to become lost on this last portion, for it travels through heavy forest, and the use of a GPS device is a great help. We got to the first lake about one thirty in the afternoon and were plenty tired. We set up camp on a ridge overlooking the lake, and could see there were plenty of rises even in the sunny side of the lake. I have never been to this lake and not caught my limit of small brookies from seven to ten inches. I told my companions this on the way in to encourage them up the last mile, although I am not sure they believed me. The first cast I had two strikes before I got a hook up and brought the fish in. As soon as my companions got their rigs set up and started casting, they were believers. The fish seemed particularly hungry, probably due to the shortening days and the cooler water, which gave the fish that extra impetus to feed before the lake iced up. I have been to this lake at all seasons, but the fall always seems best. To give you some idea of how desperate the fish were, let me describe how they attacked my bubble and fly rig. Do you think there are fish in there? My bubble and fly rig has a plastic bubble anywhere from eighteen to twenty inches up the line. If you are fighting a six to eleven-inch fish hooked on your fly, this results in the bubble being about a foot above the water line as one brings the fish towards shore. These fish were so hungry and desperate that other fish were jumping at the bubble above the water while I was fighting the fly-hooked fish. Now that's hungry! We had fresh brook trout cooked in foil with herbs over the wood fire and some warming soup for dinner with some chocolate bars for dessert. We fished and released all our fish after dinner, and as it darkened we stoked up the fire and topped off the evening with cocoa and rum. It was a great day, and all the action almost made us forget the soreness from the hike. We went to bed around nine, and as I nodded off I heard the wood fire crackling. I woke about midnight and the crackling was louder and the light from the fire was much brighter. Usually the fire dies down over the evening and all that is left are some embers. Not this fire. When I got out of the tent, I saw that a log some distance from the fire had caught fire, probably from some flying embers, and there was a roaring fire. Since there was a strong wind, unusual for the nighttime Sierra, we had to put out this fire before it became uncontrollable. We got all our containers, filled them with water from the lake, and doused the fire. There were still plenty of embers in the log, so we decided to drag it into the lake to eliminate any chance of an unwanted fire. In the morning we dragged the log back out. We wanted to get an early start to get to the next lake while there were still shadows on it. It was only about a mile and a third to the next lake, but there is really no trail. Although there were ducks, there were too many. The lake was in heavy timber, and if you didn't know exactly where it was, you could easily wander for hours trying to find it. This is where a GPS really comes in handy. Just put in the coordinates and let it point the way. It also gives an estimated time of arrival and your speed. It was a gorgeous sunny day, with a cool breeze blowing, and when we got to lake two, I had to give my required pep talk and mentioned that although we wouldn't catch as many fish, they would be much nicer. My record from this lake was a twenty inches, and I had never caught a fish less than ten inches. The fish were all brook trout. We worked our way down the lake to the campsites and about three quarters down the lake in the shade I yelled, "fish on!" It was a beautiful fourteen-inch fat trout, and it was difficult to bring him past the logs and lily pads before I beached him. When they saw the fish, they exclaimed , "Wow!" We hurriedly set up camp and set about fishing. We were able to catch a total of four fish for dinner, which we hung with the rest of our food in the trees, and I had a nice nap while Kelly and Gary fished. After my nap and checking the small radio for the U. of M. football score and the weather report, I went to see how they had done. They had some stories to tell and a few fish they had caught and released. That evening we made a small fire well away from any logs and had our fish in foil with almonds and herbs with soup, followed by a freeze-dried dessert of raspberries and Jell-O. Again we finished with rum and cocoa for the topper. Luckily there was no repeat of the previous night's excitement. I listened to the football scores and the weather report before nodding off. I take a radio to get the latest weather, and it has saved me on occasion. One time I was camped at a ten thousand foot lake and I heard that the next afternoon a storm was coming in that would lower the snow level to about eight thousand feet. Needless to say, I skeddaled out early the next morning and saved myself a lot of trouble. Sometimes there is nothing you can do about it, for you are too far back in to get out. During the day, Kelly was hanging out on one of my favorite fishing rocks casting a Woolly Bugger and then lying down while waiting for it to sink. Then he would slowly bring the line in little jerks while still lying on the rock. All of a sudden, I saw him jump to his feet and start fighting a fish. It took him awhile, but he landed it and just brought it out of the water long enough to measure and take a picture. Yes, the picture is part of what is included. It was eighteen inches, which makes it the second largest fish that I have seen come out of this lake. I tell you this just to encourage you PFFers that fish will be bigger this year when I schedule my Fall trip to said lake. The next day we had a full layover day that we spent exploring other nearby lakes. One of these had a trail by it, and while we were there a ranger came by on a horse, leading a mule carrying some of his gear. He was quite friendly, and Kelly, who used to train horses, was able to give us a full rundown on the horse's genetic background. The ranger was the only person we saw for the whole four days. The fish in this lake were about as hungry as those in the first lake but a little smaller. We also visited a lake that had some rainbow in it as well as brookies, which was a pleasant change. We carried no fish back to our camping lake, for we could catch as many as we needed. 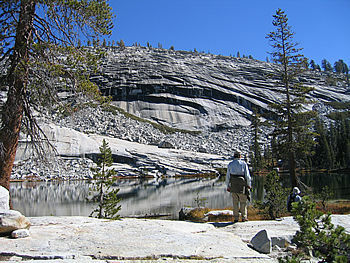 Gary visited another lake alone that I had been to before using his GPS to find his way back to our camping lake. He yelled to us from the mountain above us over six hundred feet above us, but neither of us heard him. The next day we packed up and walked out, and we all had a great late lunch meal at a good Mexican restaurant in Big Oak Flat on the way home. What a great trip! Did I mention that the fish will be bigger next year?